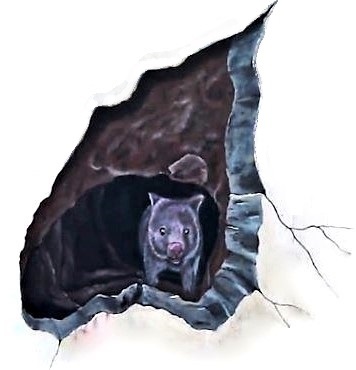 The Story of The WOMBAT MURAL in WARRNAMBOOL That Went Viral!!! Warrnambool’s wombat street art is a happy accident : Jimmi was testing out a temporary street art design on the bridge next door, only to find it had been made permanent by the guy who used to get rid of graffiti. This is the story of how the town of Warrnambool wound up with its distinctive new art, that’s gone viral, with over 38 million views on the Facebook video. 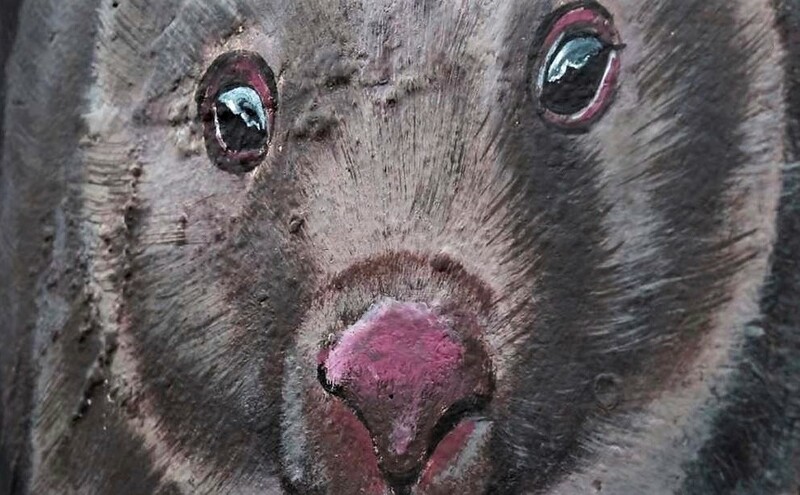 This is the funny story of the temporary wombat artwork by Jimmi Buscombe, which unexpectedly became a permanent piece of street art, due to Phil Hoye secretly preserving it forever, in Warrnambool, Australia, and now going viral around the World. 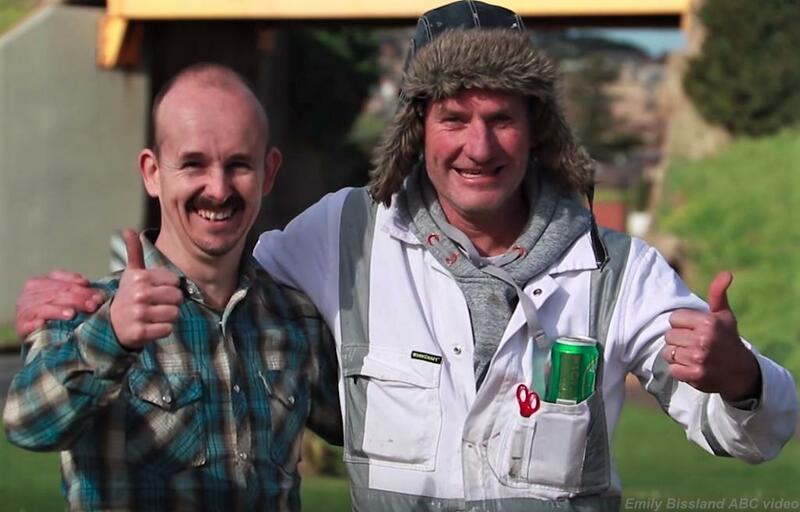 This real-life comedy of errors brought together two unlikely friends that were divided by the wall of the railway bridge, between their homes. Now they are great mates due to this wombat. 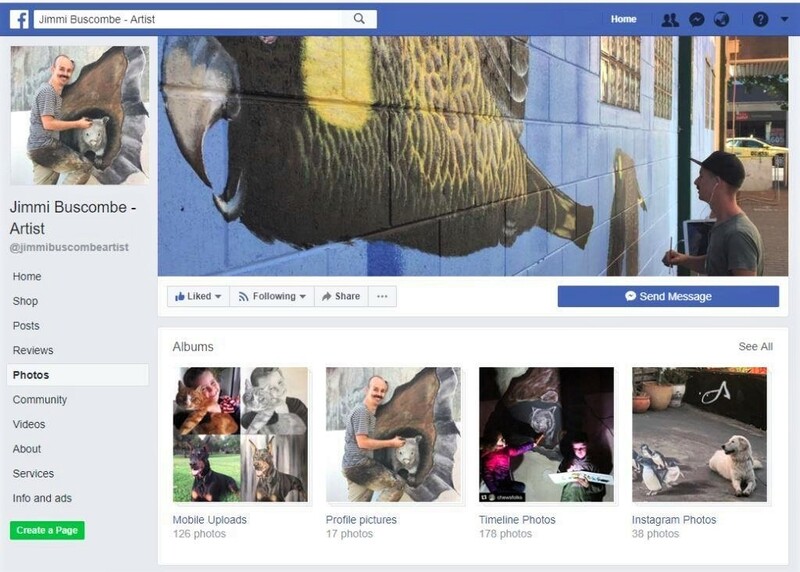 The “Accidental wombat mural in Warrnambool” video was uploaded by ABC South West ViC on Wednesday 1st August 2018, and had over 12 million views within the first week of being uploaded, and over 21 million views in the first 3 weeks, with a total of 38 million views in 2 months. 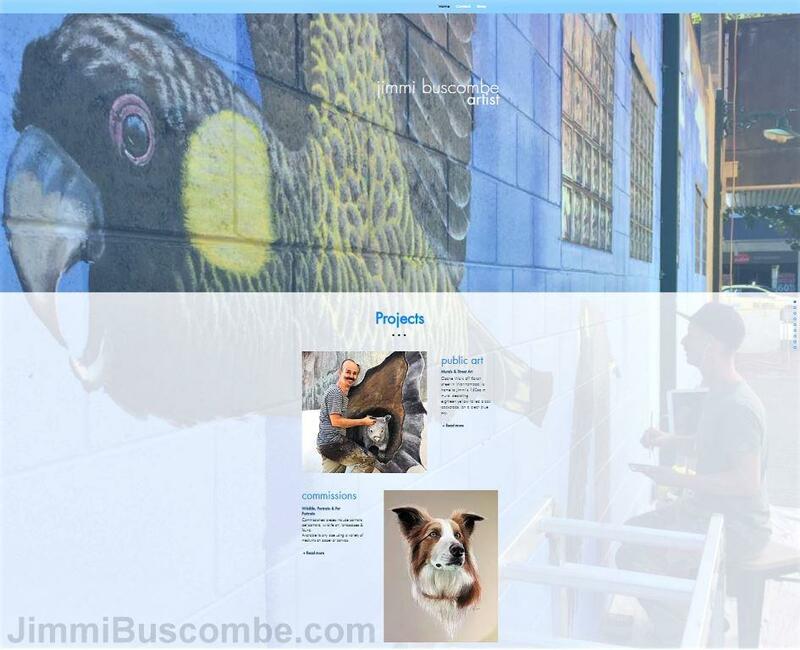 Where is the wombat mural in Warrnambool? 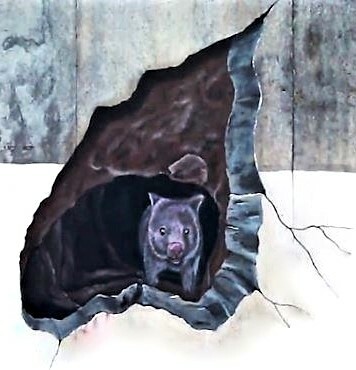 The wombat mural by Jimmi Buscombe can be seen at the Otway Road rail overpass bridge. Phil Hoye lives in Warnnambool, originally from Gooroc near St Arnaud, in Victoria. He was once the graffiti removalist contractor for Warrnambool City Council. Phil is a involved in a local business, Country 2 Coast Painting Services. Dave Hughes the comedian, radio & television presenter was born in Warrnambool in 1970, where he attended Christian Brothers’ College. Hughesy co-hosts Hughesy & Kate on the radio, and hosts Hughesy, We Have a Problem on TV. Tom Ballard the openly gay comedian, radio & television presenter was born in Warrnambool in 1989, where he attended Brauer Secondary College. Tom is best known as host of Tonightly with Tom Ballard, a news and culture TV program on ABC Comedy channel, since 2017. Smoky Dawson the country music performer briefly lived in Warrnambool. Ben Barber the actor on Neighbours grew up in Warrnambool. Paul Jennings the children’s author lives in Warrnambool. Sir John Eccles the Nobel Prize winner in physiology or medicine attended Warrnambool High School (now College). Brian Fitzpatrick the author, historian, journalist, and one of the founders of the Australian Council for Civil Liberties, was born in Warrnambool. Danielle Green a Member of Victorian Parliament was raised and educated in Warrnambool. Sally Walker the Law Professor, Vice-Chancellor & President of Deakin University studied at Warrnambool College. Airbourne the hard rock band formed in Warrnambool in 2003. Jono Pech the author and podcast host from Warrnambool. 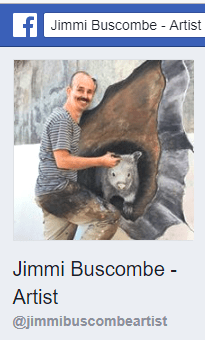 Jimmi Buscombe the artist that drew a wombat on a bridge in Warrnambool. Phil Hoye the bloke that saved Jimmi’s wombat art on the bridge in Warrnambool. Warrnambool is a large town on the south-western coast of Victoria, Australia, with a population of 34,618 (June 2016). Warrnambool is located at the western end of the Great Ocean Road on the Princes Highway, and at the southern end of the Hopkins Highway. The word Warrnambool originates from the local indigenous Australian name for a nearby volcanic cone, and also interpreted to mean land between two rivers, two swamps or ample water. The first documented European discovery of Warrnambool was in 1800, by Lieutenant James Grant, a Scottish explorer who sailed the Lady Nelson along the coast and named several features. The website by Great Ocean Road Regional Tourism provides a main menu featuring : Where to stay, What to see & do, What’s on, and Getting there. Plan your visit with suggested itineraries that cover local coffee spots, beaches and lookouts. The Holiday Blog helps you discover the hidden secrets of Warrnambool from other holiday makers, with tips on trips with kids, the best eating spots, and things to do on rainy days. Waddle your school holidays look like? Why not duck into @flagstaffhill_warrnambool for LITTLE WINTER fun! 📸@tarmacstudioz (on a serious note, the friendly flaggy ducks will try to follow you home if you sprinkle the free feed offered at reception, but don’t forget about the turkeys, sheep and Maremma dogs – they like to say hello too).